As top athletes get older, the thought of not being among the best is so hard to deal with that it leads many to retire before that becomes a reality. It becomes more difficult for them to find the motivation needed to endure the sacrifices that sport at that level necessitates and, once that goes, the rest quickly follows. For Rachid Chouhal, however, that was never really an option. “I don’t think I will ever get to a point where I will decide to quit,” he states, despite a career spanning almost two decades. Indeed, his passion for the sport is such that he has begun looking for new challenges to test himself, the main one being Masters Athletics. This has proven to be particularly successful. Last year, Chouhal narrowly missed out on confirming himself as one of the world’s best in the 100m, ending up among the finalists at the World Masters Championships. “At the World Masters, I was well prepared since I was and still am the world’s top-ranked athlete in 100m,” Chouhal said. “I was incredibly happy to win my first round and qualify first for the semi-final and later the final. I was so proud to hear Malta mentioned many times during the meeting. Although he has enjoyed the challenge offered by Masters Athletics, this does not mean that Chouhal is no longer taking part in Open competitions. “Masters Athletics is a good test for me, the level is still high and you have to race in various rounds to reach the final which needs a lot of preparation, dedication and hard work,” he explains. “I expect to make the finals in those competitions while in open races, I try to go for a season best. Chouhal has even found time to pick up a new event, the hammer throw. 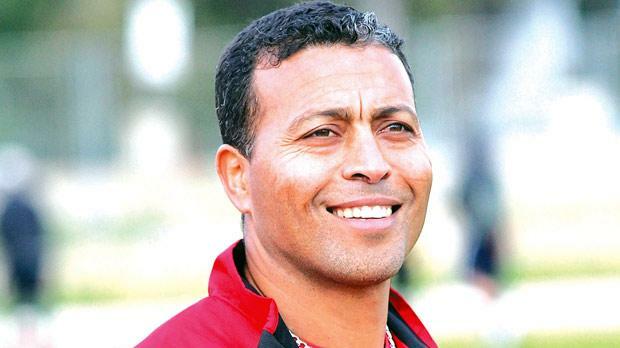 “I am a qualified track and field coach and I believe to be a good trainer you need to be part of what you are coaching,” Chouhal said. “If you coach sprints and you’ve never been a sprinter, I don’t think you will be successful. It looks as if he has achieved that ambition. Those words reflect the intensity he puts into the sport. “I always have targets and challenges to achieve,” Chouhal said.